Ever since paraiba touramline was first discovered in Brazil in 1989, gem buyers have coveted gemstones with a vivid aqua blue color. Though the copper-bearing paraiba was eventually found in Nigeria and Mozambique as well as Brazil, the desposits were all very limited and it remains an exceedingly rare (and expensive) stone. There were very few alternatives to paraiba tourmaline in the market. Though there are non-copper-bearing blue-green tourmalines from Afghanistan and Mozambique, blue is one of the rarest colors in tourmaline and very few of these stones approach the bright windex-like blue that made the paraiba tourmaline so unique and valuable. There are two gem varieties that we suggest to buyers looking for this distinctive color. The first is apatite, a phosphate mineral that is sometimes found in gem quality. Transparent apatite is typically green, but low temperature heating of some specimens can produce a vivid blue or greenish-blue that can rival the best paraiba tourmaline color. 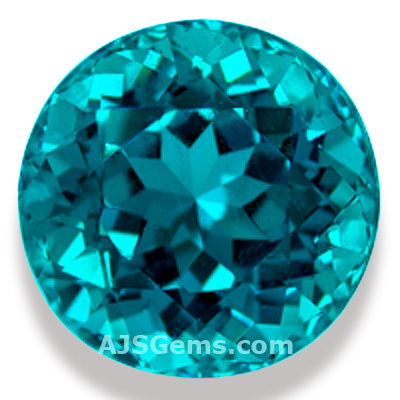 The best apatite in the market is currently coming from Madagascar. Clean gems with a vivid blue have risen significantly in price due to market demand, but the cost is still a small fraction of that for paraiba tourmaline, making blue apatite an attractive buy. The main limitation with apatite is that it is not a particularly hard material, with a rating of 5 on the Mohs scale (compared to 7.5 for touramline). So apatite is mainly used for pendants, earrings and occasional wear rings. 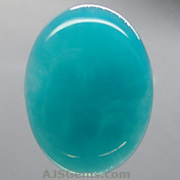 The other vivid greenish-blue gem we recommend is a type of quartz chalcedony known in the trade as gem silica. Like paraiba tourmaline, it derives its intense color from traces of copper. High quality gem silica is a translucent gem which is usually cut as cabochons rather than faceted. One of the attractions of gem silica is that it is quite hard, with a rating of 7 on the Mohs scale. Gem silica is a rare gem -- much rarer than apatite -- and has become popular with collectors and jewelry designers.